There are so many new restaurants opening in Miami these days that I have given up on the prospect of keeping current with all of them. In fact, I've somewhat happily resigned myself to the opposite: I'll just wait six months, and a good number of them will have already closed. Still, amidst this latest wave, there are some good things happening. I was sad to see Little Bread (formerly Bread & Butter) close in Coral Gables as Chef Alberto Cabrera heads off to Las Vegas, but was happy to see a promising-looking replacement coming into the space; Ichimi Ramen. 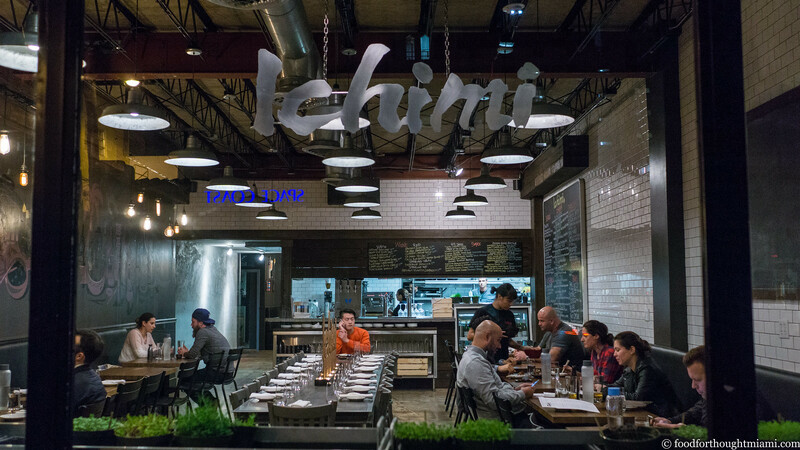 Ichimi is a ramen-ya and izakaya run by Chef Constantine DeLucia, who previously worked at Momi Ramen as well as Lure Fishbar and Estiatorio Milos. I've already been in there twice since it opened a couple weeks ago. Like Momi, Miami's only dedicated ramen specialist, the noodles are made in-house. The prices are also close but not quite at Momi-esque levels (depending on contents, ramen bowls run $18-22), though at least they take credit cards so you don't need to bring a wad of cash. The menu currently features four styles of ramen (tonkotsu, seafood, veggie, and beef brisket) as well a few cold ramen dishes. They are planning to do tsukemen (plain noodles served with an intense dipping sauce on the side rather than in broth), but it wasn't yet being served on either of my visits. (You can see all my pictures in this Ichimi Ramen flickr set). 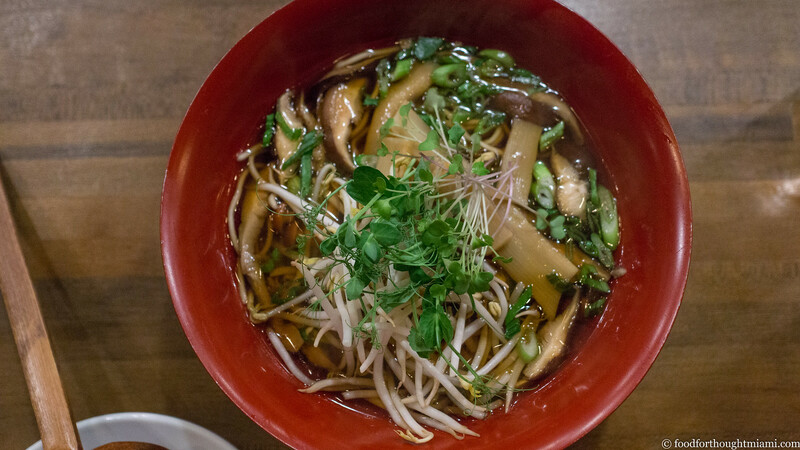 The first bowl I sampled was their veggie ramen, and it was great: a focused, flavorful shoyu broth (that I assume starts with a kombu dashi) stocked with shiitake and nameko mushrooms, bamboo shoots, bean sprouts, and a bouquet of pea shoots and tiny greens. The noodles are simultaneously hardy and supple, with a nice spring to them. It brought back memories of one of the first and still best bowls I had at Momi, a vegetarian ramen I've never seen on the menu there since. I've also tried Ichimi's tonkotsu ramen, which was good but not a show-stopper: the slabs of pork belly were delicious, but the broth lacked that lip-sticking unctuousness that typically characterizes the long-cooked pork bone elixir. 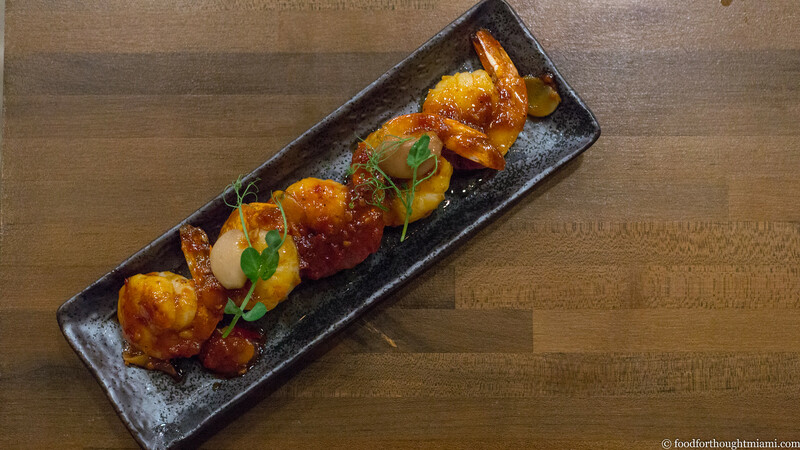 Ichimi also offers a pretty extensive menu of "izakaya" type small plates, most of which are much more ambitious and chef-y than your average izakaya. 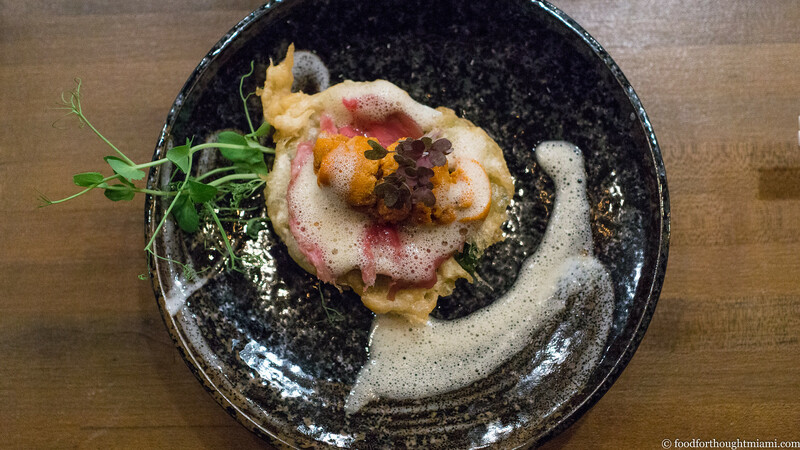 Maybe the best example is this "uni taco," which cleverly uses a tempura-fried nasturtium leaf as the tortilla, then tops it with a slice of wagyu beef, a couple lobes of tender, bright-orange sea urchin, and a spray of shiso "air, with a final garnish of purple micro-shiso and more pea tendrils. Shrimp (listed on the menu as mantis shrimp, but the chef came out to tell me that the supply of mantis shrimp had not come in that day) are served with a fermented chili sauce that has both heat and funk, served with confit garlic for some additional depth and still more pea tendrils for some freshness. One of my favorite things, beef tripe, is tender and sticky from a dark chili and garlic infused glaze. 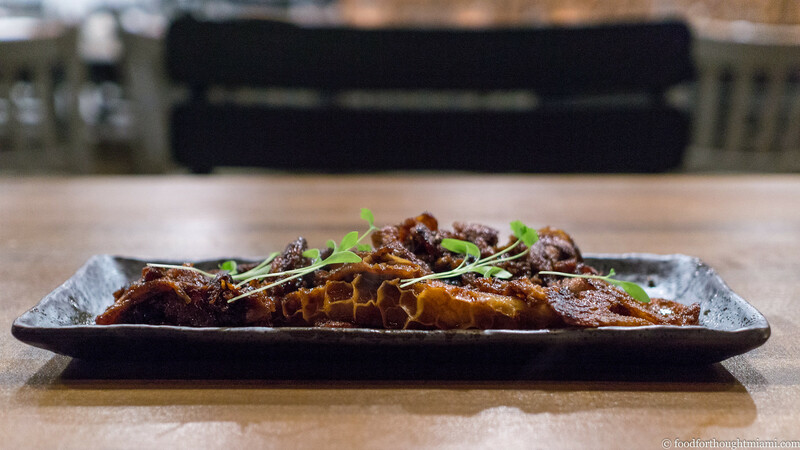 Organ meat fans will also find crispy pig ears (with soy ginger foam, sesame pearls and micro radish) and bone marrow (pan seared and panko crusted, with sautéed shiitakes). 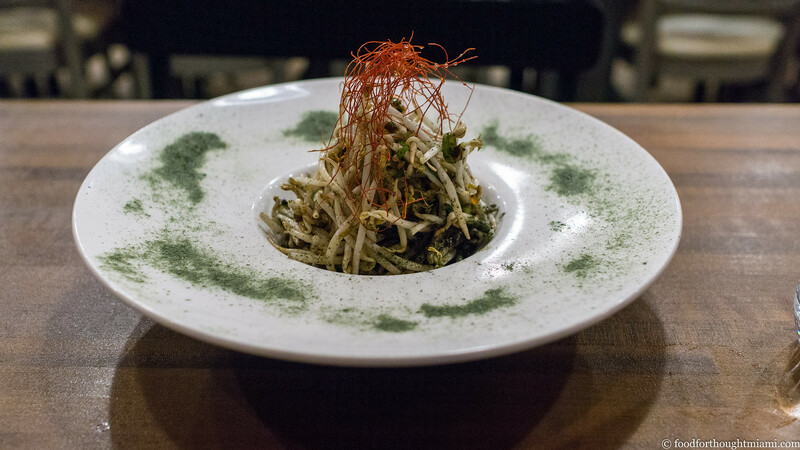 For something lighter, this salad of crisp, fresh bean sprouts, dressed in a rice wine vinaigrette, dusted with nori powder, and crowned with dried chile threads hits the spot. 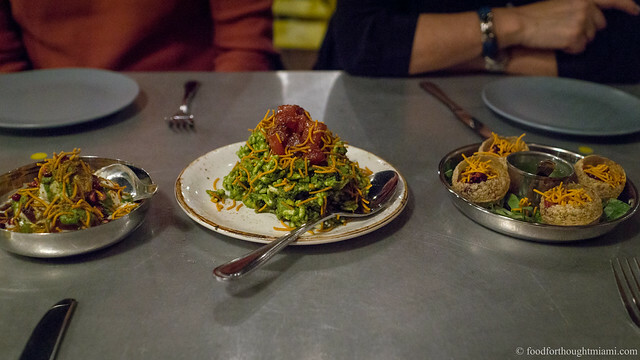 There's also butter poached carrots with a red miso zabaglione, or a choy (a/k/a celtuce) with garlic, ginger and chili. And that still only covers about half of the izakaya choices – you can peruse the whole Ichimi menu here. I love having a new ramen-ya in town, especially one so close to my office. I admire the ambition of the rest of the menu, a good bit of which hits its target, if my limited sampling is an accurate indication. I look forward to working my way through the rest of the menu, and to the complete menu, including the tsukemen options, getting rolled out. While I'll be the first person to tell you that you shouldn't balk at paying $20 for ramen if you're willing to pay $20 for a pasta dish, it also just bugs me that even in higher-rent markets like New York and San Francisco you will still find high-end ramen for $15 and under. There is, I think, a one-word explanation: volume. But I'm concerned that these fares will be prohibitive especially for the lunch trade which makes up a big part of the Coral Gables business. Thanks for your great review-can't wait to try it! Can't wait to visit, looks like CHEF is using quality ingredients, and that noodle machine can't be cheap, nor is the rent I presume!! !